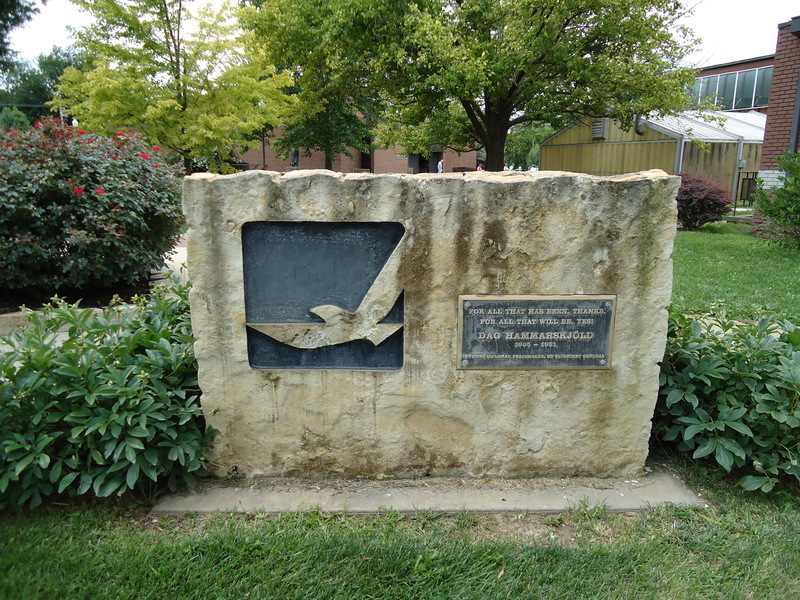 Visitors to Bethany College in Lindsborg, Kansas, note a marker in front of Presser Hall. There is a dove–the symbol of peace, flying against a field of blue. Carved into the rock is this message “For all that has been–Thanks! To all that shall be–Yes!” The marker was the gift from a family who both gave thanks for both the past and said “Yes!” to the future at this wonderful, small Lutheran college on the Great Plains. The marker was dedicated on March 21, 2005, by Jan Eliasson, the Sweden’s Ambassador to the United States who had just been elected President of the United Nations General Assembly. The quote is from Dag Hammarskjöld, the Swedish diplomat who became Secretary General of the United Nations sixty years ago this year, and is found in his spiritual diary known to the English world as “Markings”. Never look down to test the ground before taking your next step: only he who keeps his eye fixed on the far horizon will find his right road. A heart of faith–that I may abide in Thee. For all that has been–Thanks! For all that shall be–Yes! Composer Eskil Hemberg has set many of Hammarskjöld’s texts to music. Our nation is commemorating several historic and important anniversaries this year. Especially mindful this week is the 50th anniversary of the March on Washington and a moral vision for our country set through the soaring words of Dr. Martin Luther King Jr. It is well to observe another anniversary of international significance that occurred in 2013. Sixty years ago, Dag Hammarskjöld (1905-1961), the Swedish economist and diplomat, stepped on the international stage when he became the second secretary-general of the United Nations. Roger Lipsey has written the definitive biography of Hammarskjöld, the diplomat, statesman, author, and one the world’s most recognized figures during the mid-century. The author brings his readers closer to an understanding of Hammarskjöld’s spirituality and strength and integrity as he dealt with critical pressures and global issues in the Middle East, China, the Soviet Union, and the Congo. Lipsey also draws our attention to Hammarskjöld’s encouragement of art and music as a way to lift people together to greater purpose. “A great book about a great man who must not be forgotten in a time which more than ever needs to see the footprints of Dag Hammarskjöld–the combination of wholehearted engagement in the world and familiarity with the spiritual ‘journey inwards,'” writes K.G. Hammar about Lipsey’s book. 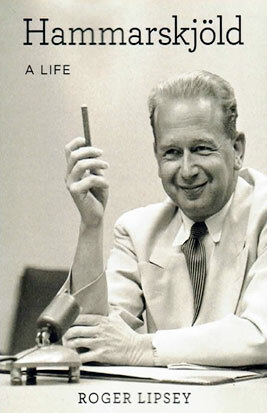 Hammarskjöld: A Life, was published this spring by the University of Michigan Press. The book most closely identified with Hammarskjöld, his own spiritual diary Markings, was published in Sweden forty years ago this year. That will be the next discussion. Lindsborg, Kansas: March 28, 1882, the Bethany Oratorio Society performs Handel’s “Messiah” for the first time. This Sunday, March 24th, 2013, marks the beginning of the 132nd Messiah Festival of the Arts, including the performance this Sunday–Palm Sunday–of “Messiah” in Presser Hall Auditorium. The young and gifted musician, Alma Lind Swensson, who was also the wife of Carl Aaron Swensson, pastor of Bethany Lutheran Church, taught the first choir note by note, phrase by phrase, not in their language–Swedish–but in English. The gorgeous singing continues today–the story of the miracle of Easter. Thanks be to God! Hallelujah! “God created March in Minnesota so that those of us who don’t drink would know what a hangover is like.” Garrison Keillor. Here we are more than half-way through March, and we still have over two feet of snow in our yard, and the windchill this morning is -8. March has been a weather month we’d just as soon forget, but we’ll be talking about the snow, sleet, frizzle, snow, snow, drizzle, snow for years. It seems that we have returned to the winters of my childhood. Not long ago my brothers and I were remembering the Saint Patrick’s Day Blizzard of ’65. The three of us looked at each other suddenly, as if we were becoming our grandfather Martin, who remembered almost everything from the day he was born at Norseland in 1882. Grandpa would often put perspective on our young lives by telling us vignettes of history in his deep voice with Norwegian accent, “Well, you know, in the old days we used to have to dig out of the snow drifts with horses.” Or, he would say, “You know, in the old days, before Marney, Estelle, and Pearl walked to school, we used to tie a rope around their waist so they wouldn’t get lost if the blizzard came up before they got to school.” Or, “We’d have to use dynamite to plant potatoes in the garden on Good Friday.” Name any subject, any season of the year, and he would give a short insight into the “old days.” We loved hearing about winter. And that Saint Patrick’s Day Blizzard of ’65 is worth remembering. Snow started falling heavily on Sunday, March 17th, and fell all day Monday. School was cancelled three days in a row that week. And then another early spring blizzard on the 22nd when school was cancelled another three days. My brothers and I were 15, 11, and 9 at the time. We had so much fun playing games, reading, resting, and realizing that we were pretty lucky to live in such a cozy farm house with people who loved us and cared about us. The whole world stopped for a few days, and there wasn’t much else we could do. It has been a returned real winter this year. There were some January mornings this year when we’d look at the forecast on our smartphone weather apps and see that the temperature should warm up to 12 below. Ah yes, like in the old days. There are beautiful memories to carry us through. We could be done with winter soon, though. We hope. Here we are, January 9th already. There are hints that the days getting longer and so we are assured that spring is coming. But it is still Christmas….if one observes 20 days of Christmas. While the commercial world long ago swept up all the remnants and ushered in a new season of buying, there are those of us who are sitting by the Christmas tree in the evening reading the books we received as gifts, admiring the ornaments collected throughout our lifetime, lighting candles, listening to the music of Christmas and Epiphany–and hearing more of its beauty. 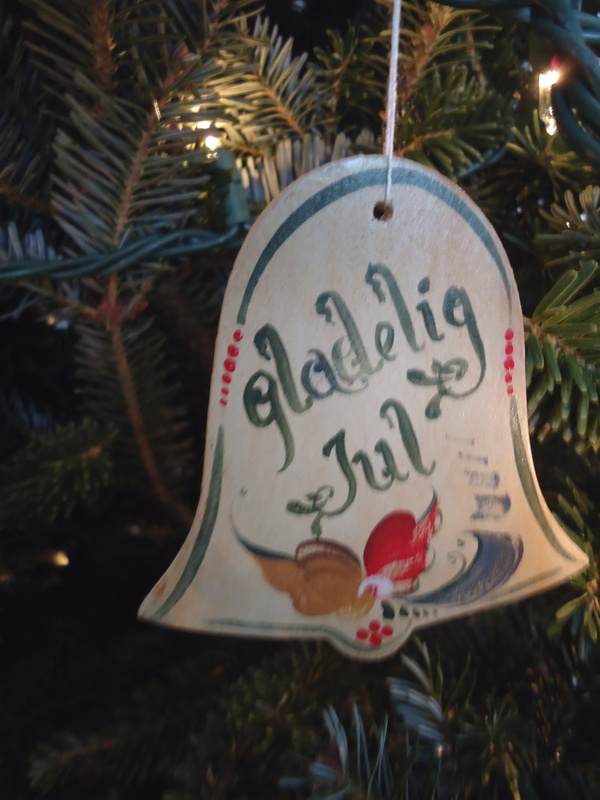 Twenty days of Christmas has been celebrated in Sweden since 1680–King Knut’s Day or Tjugondedag Knut. And the idea of Tjugondedag Knut was brought with immigrants to America, too. Older people in my home church–Scandian Grove Lutheran Church–founded in 1858, used to say “Tjugondedag Knut er Julen ut.” Roughly translated, it means something like “Twentieth Day Knut and Christmas is out.” In Lindsborg, Kansas–founded in 1869 and the most Swedish community in America–they will celebrate King Knut’s Day with a potluck dinner at Bethany Lutheran Church. People will have put their Christmas trees on the street corner and volunteers with pickup trucks will haul the trees for recycling. At the American Swedish Institute in Minneapolis there will be a party for children and they will take the decorations off the trees as Christmas ends. And so Merry Christmas, God Jul, Glaedelig Jul. Enjoy these four more days of Christmas! “As the dark awaits the dawn….” were the opening words of the choir anthem at First Lutheran Church on the Third Sunday in Advent. Through a Nordic lens, we understand what waiting for dawn–light–means. In Minnesota today, sunrise is scheduled for 7:47. For our family in Uddevalla Sweden, the sun rose on the smooth rocks of the western archipelago at 8:58 today. And it was 10:00 a.m. before stretches of dawn reached the stunning facade of Nidaros Cathedral in Trondheim, Norway. While we wait for dawn, we light candles at breakfast, and three candles on the Advent wreath, and know that Light is coming soon. As the Dark Awaits the Dawn is a poem of Advent, written in 1996 by Susan Palo Cherwien, and may be found in the Evangelical Lutheran Worship book, hymn number 261. The gentle melody, Lucent, is by Carl F. Schalk. Augsburg Fortress is the publisher. O Star of promise, scatter night, loving bright, loving bright, til shades of fear are gone. We long to see your day arise, whole and wise, whole and wise, O Lucent Morning Star. may we your healing light release, living peace, living peace, unto your holy dawn. that through us stream your holiness, bright and blest, bright and blest; come dawn O Sun of grace. On the Eve of Saint Lucia, December 12, 1859, Johan Lind brought his new-born daughter to the old stone church at Broddarp, Sweden where she was baptized Alma Christina at the ancient font. Anderson and Signe Gusta, farmers from Grondal, witnessed her baptism. The records show she was the last child born and baptized in the parish that year. Last summer, my husband and I drove through winding roads deep in the Swedish forest, and there, in a clearing we found Broddarp. The old church was replaced by a newer structure in the late 1890s when the Linds were now living in the the Midwest. The photo below is of the old church and it’s wooden bell tower. Thanks to the kindness of Mikaela Anderson and her father Rolf Anderson, we were able to go inside the new church and there was the baptismal font –the same font–where Alma received her name and from where she began her life’s journey. Here we are in the second week of Advent 2012. We’re enjoying a beautiful 12 new inches of snow–perfect at this time of year. Amid all the wonderful things to do this week are the moments to reflect, remember, and celebrate. Today, December 11, is the birthday of Alma Christina Lind. She was born on this date in 1859 in Broddarp, Sweden (there may have been at least twelve inches of snow that day) to Johan and Fredrika Lind, an old soldier and his wife. Alma was their first daughter and second child. The days of Advent were a busy time for Scandinavian women in 1859, in a much different way than our lives today. Women were in charge of butchering, brewing, candle making, baking, and intensive cleaning in preparation for the days of Christmas. Fredrika, as she recovered from the birth of her new baby, hopefully took time to rest a little, and ponder a new baby at Christmas. There in her arms, the promise of a future yet unseen. Within four years, Fredrika and Johan would leave Sweden for America– first to Andover and then to Moline, Illinois. When Alma married Pastor Carl Aaron Swensson in 1880, she moved to Lindsborg, Kansas where her life and gift of music would influence generation upon generation. In their old age, Fredrika and Johan would move to Lindsborg, too, and were witnesses to the great things their daughter accomplished. Advent. The great period of anticipation. Longing, hope, newness, joy. Last Saturday, November 30th, I travelled with my three college roommates to Tyler, a little town on the great Southwest Minnesota prairie, settled more than 125 years ago by Danish emigrants. Our roommate Punky (Nealna) Bollesen Gylling grew up at Danebod Lutheran Church and we joined her there to celebrate an old fashioned Danish Christmas. We strolled through their julebutikker filled with handmade ornaments, delicate hardanger, counted cross-stitch, tatting, painted wooden nisser. We sat underneath the 17-foot locally grown Colorado Blue Spruce Christmas tree drinking very good coffee and sampling kringler, rosettes with lingonberries or prune sauce garnished with whipped cream, and the famous aebleskiver. After a walk through town, we ate a traditional Danish supper of frikadeller (meatballs), medisterpolse (spiced sausage) pork roast, mashed potatoes and gravy, red cabbage, vegetables, salads, and dessert. At the church, where a ship hangs from the ceiling as is tradition in churches in Denmark, we heard gorgeous music of the season performed by the handbells and the choir. AND THEN, we walked across the street to the gym hall, through the welcoming open door where we joined hands and danced around the Christmas Tree. Three rings of dancers, people of every age, singing in harmony Nu ar det jul igen (Christmas is Here Again), Deilig ar den himmel bla (Splendid Are the Heavens High), O Come All Ye Faithful, Deck the Halls, Silent Night, and other songs that these people have known all their lives–and their parents and grandparents, and great-grandparents before them. This was the 125th year of dancing around the Christmas tree at Danebod–a tradition tucked in mind and heart as the immigrants crossed the great ocean from Denmark to America to the Minnesota prairie, and celebrated ever since. During the prayers of the church Sunday morning–the First Sunday of Advent, Pastor Julie Thul gave thanks “for our foremothers and forefathers who brought joy and happiness to the difficult work of making this prairie home.” What anticipation they must have had as they lit the first Advent candle, looking forward to the hope and joy this season brings. At home this second day of Thanksgiving. Tomorrow–back to the Minnesota History Center to help with a members-breakfast celebrating the opening of our new exhibit, Then, Now, WOW! More on that another time. Thanksgiving Day is one of those times that connects us so deeply to our life experience, and to the present moment as one prepares the traditional feast. I was up at 5:45 a.m. On our kitchen island, I light a candle in memory of my foremothers–Gulina, Johanna, Lena, Nickolina, Meta Catherina, Maria, Augusta, Eva, Hattie, and my mother Eleanor–and in honor of my Aunt Pearlie, and my mother’s cousin Marian Nelson Glew who took me under her wing while I was in college. Marian coached me on the finer points of making bread, rolling sugar cookies, making pie. There are many women for whom I give thanks early on Thanksgiving morning, among them Laura Lind Webster. When I was newly married to the pastor of our church, Laura–whom I had known all my life–gave me a recipe with the simple words: You might like to have this. It was her recipe for Never Fail Pie Crust. It never fails, she said. It is, perhaps, one of the most valuable recipe in my collection–and in all the 38 years that I’ve needed to make pie–for lawn socials, picnics, Memorial Day dinners, pie and coffee events, dessert, and for Thanksgiving, this recipe never fails. Here it is–it makes approximately four crusts. 3 cups flour, 1 1/4 cups shortening, 1 tsp salt: cut shortening into flour and salt. In a separate small bowl, combine 1 well beaten egg, 5 tbsp cold water, 1 tbsp vinegar. Pour into flour mixture all at once. Blend the mixture with a spoon just until flour is all moistened. This is an easy crust to handle and can be re-rolled without toughening. It also keeps in the refrigerator for up to 2 weeks. You’ll give thanks for Laura Lind Webster, too.